In a city where food standards are exceptionally high with a mind-boggling variety on offer, I was hesitant to go with the Asia’s Top 50 list or Michelin recommendations; I’m still guaranteed excellent food without the crazy price tags. 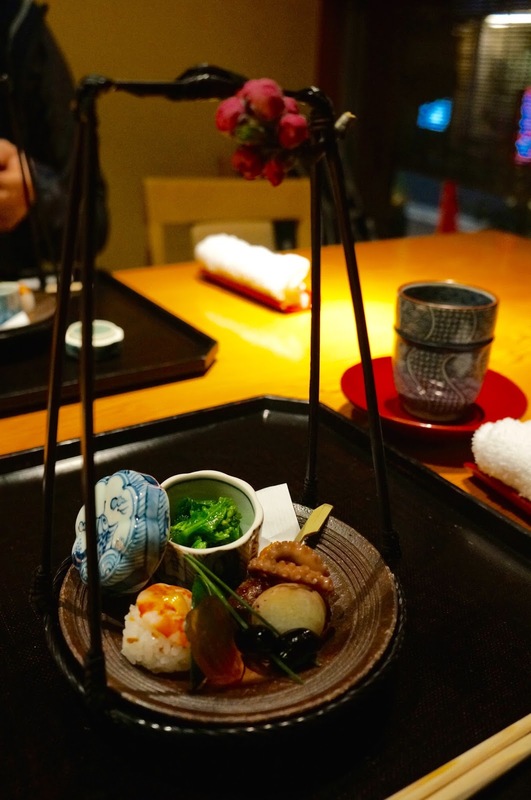 Nihonbashi Yukari serves Kaiseki-style dinner in a warm traditional dining room. It has some heritage as Chef Nonaga is the third generation to run the restaurant since his grandfather opened it 80+ years ago. Since then Chef has won the Iron Chef Japan Cup in 2002, politely declined interests from the Michelin men and continues to serve the Imperial family. Let’s hope that’s enough to impress the man. There is no English signage outside the restaurant; ask around like we did or look for a modest glowing door next to a small pebbled garden. The menu was pre-decided as we agreed on our budget upon booking. We sipped on tea as our hostess presented the first course; she spoke good English to explain each dish. Sorry it’s not a great photo - think I was really hungry. The slice of lightly smoked fish was moulded between two layers of kombu-flavoured agar, drizzled with a sweet soy dressing. It reminded me of jellied eel but much more subdued. The presentation was exquisite, each piece had incredible attention to detail. There was a lot going on; the best of the selection was the two black beans skewered by straws willowy grass. The shiny pearls were sweetened and marinated to give a sticky, grainy and slightly chewy texture. Not everything was perfect though, the disc of octopus was stale to the point of flakiness, almost like it had been left on the counter for weeks. A part from that, the ensemble is carefully balanced with delicate flavours. The green pea soup was very clean with a distinctive earthy aftertaste, quickly washed away by the crunchy bamboo shoot. The bloc of fish cake gave the dish more substance, but I have always thought fish cake is just fish cake. He wasn’t sure what I meant when I say tuna is generally quite ‘fishy’, in the sense that it’s quite pungent like mackerel and sardines, while most white-fleshed fish is much milder. I know he still doesn’t get it because it was brought up again two evenings later. I can’t remember the name of the fish, but our hostess explained it was in season only for a few weeks in spring. It’s not my kind of dish, I prefer something slithery and soft, this was too stocky and dense, a tad dry as well despite the sweet soy sauce. Similarly the carrot cake was stale and crumbly - sadly this dish fell flat. The vegetable was mildly pickled with vinegar, mixed with strips of duck and a generous sprinkle of bonito. I wouldn't write home about it. The stretchy yam dumpling was marshmallow-like, soft and playful, with a sea urchin (uni) filling that was bursting with umami. The interesting combination worked surprisingly well with the slice of Spanish mackerel at the bottom, which I would describe as a very ‘fishy’ fish. The clear gelatinous consumé, however, tipped it over the gooey edge for me. I love porridge, or congee, especially fish ones. This red snapper porridge with clouds of egg and clams was an excellent finish to the meal. The ice cream tasted like roasted malt, or a roasted soy bean flavour with sweetened black beans and crispy toasted rice. Kaiseki is often a pricey affair, but it was all quite reasonable at Nihonbashi Yukari; we requested 10,000 JPY per head for our dinner, which is less than half of a Michelin starred restaurant would demand. Stripped of the unnecessary pretence and ostentation, the cosy dining environment allowed us to take our time over each course, and as usual, we did. While I have had more elaborate kaiseki meals elsewhere, I thoroughly enjoyed my time at Yukari. Perhaps my amazing company and our conversations were more memorable than the food, but I felt Yukari was perfect for the occasion.